What is The Big Switch? 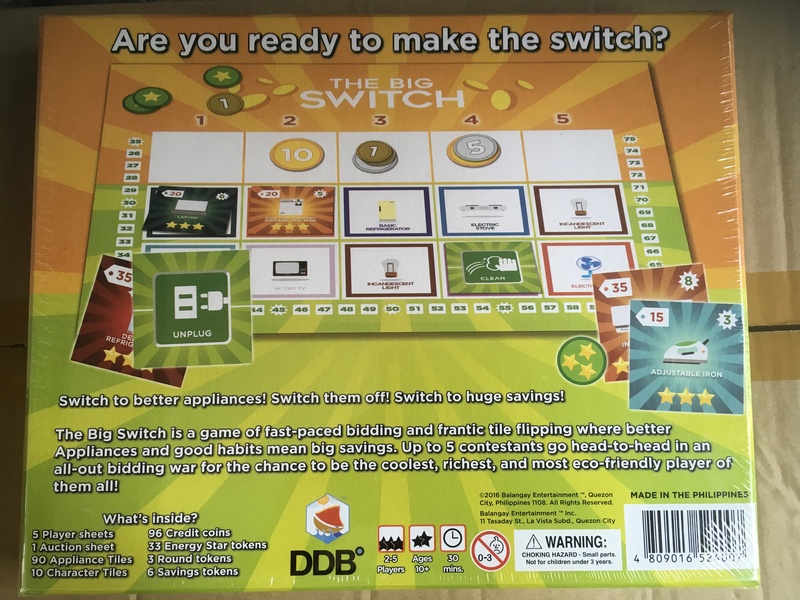 The Big Switch is a real-time bidding and tile-flipping dexterity game about energy conservation. In each round, players try to outbid each other in 20-second auctions to buy efficient appliances for their homes, while simultaneously doing energy saving habits. Players compete to have the most Energy Stars which they get from buying appliances and doing habits. The player with the most Energy Stars after 7 rounds is the winner! The Big Switch is a game for 2-5 players, ages 10+, and takes around 15-30 minutes to play. Before I describe what happens in a round, here are the basic components of the game. Each player gets a House Sheet which represents your house at the start of the game. Notice that all your starting appliances are old and inefficient. The primary way to get Energy Stars is by buying efficient Appliances. Appliances come in different types and with different Star-ratings, minimum bids, and Savings. Aside from giving you Energy Stars, buying efficient appliances also increases the overall savings of your household which gives you more money in the next rounds. Use your money tokens to bid for appliances during the auction. You get money every round depending on the savings of your household. Buy more efficient Appliances to increase your savings. EDIT: The App is now also available in iOS 🙂 Just search for The Big Switch in the App Store 🙂 More info on the app can be found in this blog post about the App. What happens in a round? At the start of each round, each player collects money depending on the savings of their household. At the start of the game each player only receives 25 Money since their appliances are not very efficient. As players get better appliances, their savings increase. Place 5 random appliances on the Auction sheet for each player to see then give the players some time to look at the available appliances so that they can strategize which appliances they want to buy. Once everyone is ready, start the auction timer! Each player will have 20 seconds to do two actions: Bid for Appliances and Perform Habits. Note that in the first round, players can’t Perform Habits yet because no one has any appliance tiles. Notice the white squares on the House Sheets? Those are your bidding slots which correspond to an appliance for sale. While the auction timer is running, players place their money on the slots of the appliance/s they want to buy. You can bid for as many appliances as you like (as long as you have enough money). Once you have an appliance, you can do energy-saving habits to get extra Energy Stars. To do a Habit, flip over an appliance and orient it towards you. There isn’t really a reason not to do your habits. However, since you have to do them during the 20-seconds, they will take time away from you bidding and checking out what everyone else is doing. After the timer is done and before awarding appliances, the players are rewarded Energy Stars if they are able to do ALL their appliances. If you miss out even just one Appliance, you don’t get the reward. The number of Energy Stars you get depends on the round and is shown on the Auction Sheet. Later rounds have higher rewards. After awarding Energy Stars, reset all of your appliances by turning them to their Appliance side and orienting them towards you. Each auction round has to start from this state so no cheating! If you lose the bid, don’t worry. You get to keep your money which you can use in the next rounds. Finally, clear the Auction sheet then move on to the next round (starting with each player getting money).